An indoor rotisserie machine can be a good choice for cooking steak. The steak goes in a basket and the fat drips down off of the meat, keeping the steak from getting greasy. Rotisserie cooking keeps steak juicy and tender. You can rub sirloin steak before cooking with a spice mixture that will bring out, without masking, the meat's flavor. Try this steak preparation as you branch out from that old rotisserie standby, chicken. Wash the steak under cool, running water. Pat dry with paper towels. Rub the steaks with the olive oil. Combine the brown sugar, paprika, rosemary, black pepper, garlic powder, celery salt, chili powder, thyme and powdered mustard on a plate. Rub the steak in the mixture, coating thoroughly. Leave the steak on the plate and cover with plastic wrap. Refrigerate overnight. Preheat the rotisserie to 350 degrees F or its medium heat setting. Place the steaks in the rotisserie basket and close the lid. Place the steak on the spit rod assembly and cook for 15 minutes for medium-rare, 17 minutes for medium or 20 minutes for well done. 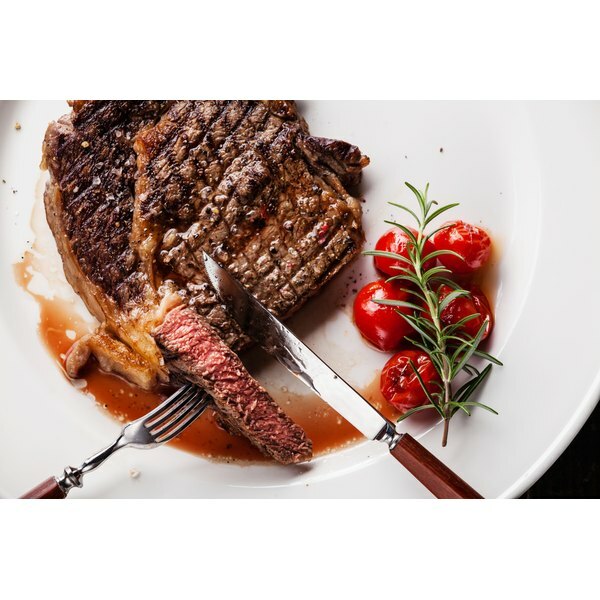 Remove the steaks from the rotisserie basket and let rest at room temperature for 15 minutes before serving.